"This is the riskiest military operation that I've ever encountered! Why the fixation on Inchon?" An official Korean trailer has debuted for the film Operation Chromite, an epic action thriller about the Korean War, specifically the Battle of Inchon. 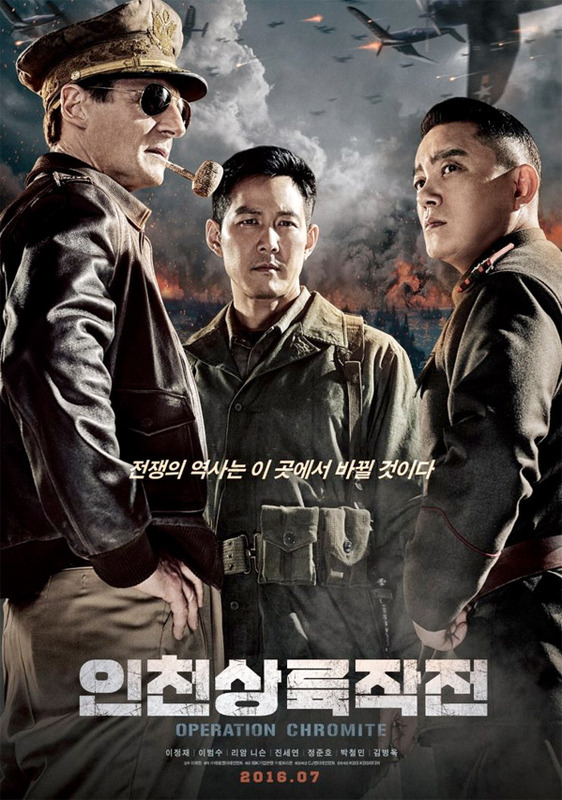 The film stars Liam Neeson as General Douglas MacArthur, the US military General who lead the campaign to land in the city of Inchon and drive the invading North Korean forces out of South Korea. There is some epic action in this involving giant battleships as well as explosions on the streets, plus hand-to-hand battles and more. The full cast includes Lee Jung-jae, Jin Se-yun and Lee Beom-su. The Koreans love making epic movies, but I'm not sure if this will be any good. Take a look. "Operation Chromite" is the codename for the Battle of Incheon that took place on September 15, 1950, shortly after the Korean War broke out on June 25 in 1950. It was a surprise attack in which U.N. forces landed in the South Korean harbor city to drive out the North Koreans, and is recognized as a turning point for U.N.-backed South Korea against the communist North. Operation Chromite will focus on eight Korean war heroes. Operation Chromite is directed by Korean filmmaker John H. Lee, of A Moment to Remember, Sayonara Itsuka, 71: Into the Fire previously. The screenplay is by Man-Hee Lee, John H. Lee and Sean Dulake. The film opens in Korea this July, and in select US theaters on August 12th this summer. Such a coup for a Korean production to get a White American actor! It would be a little tough of a sell if MacArthur was Korean in the film. I watched this trailer and it looks like garbage. Korean myself, bro. I also lived there for a few years. So yeah, I know they have skills. Just saying, it is extremely rare for them to get White Americans for their domestic films. The North invaded the South. The result of the war was pushing the North completely out of the South and re-establishing the border. You think that was pointless? You think South Koreans should have been doomed to live the same way as the North? Where did you receive your education? Or lack there of. That war meant the fate the Cold War and of our humanity in terms of the globally dominant government system: communism vs. democracy. The iron curtain never broke out into cold war but the North Koreans could have easily taken over Korea which would mean China and USSR would have helped them spread communism all over Asia. Within two months of the North Korean invasion they relentlessly pushed the south to the brink of the southern coasts and if it weren't for the success of this impossible mission made possible by a handful of brave heroes, humanity's history would be very, very different. Not to mention that this is one of the highest budget korean films with legendary korean actors. Please educate yourself before you disrespect Liam Neeson as well as Korea and its actors and films. This is some next level dumb here...you managed to one up the bad dialog in the trailer...lol "Well, it looks you have bought yourself some title of educator. I hope it was a good price, since the product is quite shabby" Who writes this garbage?? Oh wait... you do. I bet Liam's screen time totals less than 10 minutes. "Initiate Operation Chromite". Seriously? Who talks like that? And why do action films...any action film independent of the country producing said action film...why are they always so tone-deaf with regard to dialog. Initiate Operation Chromite indeed.